Janssen Park Place B&B is consistently listed as the number one Bed & Breakfast in Mena with a 5-Star rating on Tripadvisor.com and Best B&B in Mena for the past 5 years in the Mena Star newspaper. Janssen Park Place B&B is a turn of the century Georgian Revival home located in Mena, Arkansas. Mena is situated on the mid-western side of Arkansas, surrounded by the Ouachita Mountains and the Ouachita National Forest. Tens of thousands of tourists travel the Talimena Scenic Drive from Talihina, Oklahoma to Mena every year. The BnB is only 6 blocks from the beginning of the drive. One of the attractions of the scenic drive during the fall is the changing of the leaves. Check out our FB page to see a photo of the fall colors in 2018. All year long, weather permitting, motorcyclists from a five-state region are drawn to the panoramic views of the mountains and miles of isolated and twisty roads and highways. Mena hosts festivals in the spring, summer, and fall. Two of the festivals are held in historic Janssen Park right across the street from the B&B. Janssen Park is also the starting point for The Talimena 13.1 run to the top of Rich Mountain and the Wheel-A-Mena bicycle tour around and over the Ouachita Mountains. All of the events make Mena a destination for travelers from Texas, Oklahoma, Louisiana, Missouri, and Arkansas. Surprisingly, over the years, we have also had guests from New Zealand, Germany, India, Sweden, China, Australia, Canada, Pakistan, Great Brittan, and more. Mena was incorporated as a town in 1886 by the Kansas City Southern Railroad. 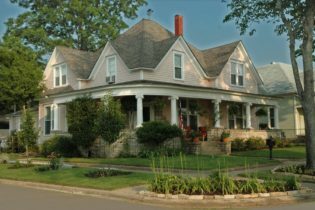 Originally Janssen Park Place B&B was a family house built in 1907 by Jack Rouse, a railroad conductor. The house evokes a slower contemplative type of living exhibited by the wrap around porch with ionic columns and a grand entry for meeting and greeting traveling salesmen and guests. This is a perfect place to have your guests sign in, chat about breakfast and then show them the dining room. There are two guest rooms upstairs which share a den. The den is equipped with a satellite TV, DVR, DVD, microwave, and refrigerator. The Margaret May room has a 20X13 foot bedroom with adjoining bathroom that features a claw-foot tub with built in shower. The Maple room has a 20X12 foot bedroom with adjoining bathroom and a walk-in shower. The rooms have king size beds but are large enough to accommodate cots for people traveling with children. The third guest accommodation is a 650 square foot cottage in our backyard. It was built in 1942 for a soldier returning from the war and his new bride. We had it completely rebuilt in 2009. The cottage has 3 rooms. The den has a satellite TV, DVR and DVD, sofa, lounge chair and occasional tables. The bedroom features a king-sized bed, love seat and dresser. The bathroom has a tub/shower combo, granite topped sink with storage below and a wall cabinet. The kitchen is fully equipped with microwave, toaster, coffee maker, dishes, flatware and pots/pans. The counter height table seats four. It is perfect for travelers staying several days or business people needing long term housing. The backyard is very low maintenance and does not require mowing or edging. All of the plants are perennials, shrubs or trees. In addition, there is a Coolaroo shade sail that covers the patio in the summer. The water feature has some very hardy goldfish that have survived for seven years. The galley kitchen is very efficient for two cooks. The gas range has 5 burners and two ovens. The dishwasher and refrigerator were replaced in 2018. The range was replaced in 2016. The range, sinks and dishwasher are on one side and the refrigerator, pantry and coffee nook are on the other. The 23X15 foot dining room is very impressive. It features an 120 Inch X 48 inch granite dining table that seats 12. There are two sideboards, a serving table, and a tea cart. There is also a gas heater fireplace. At one end there are ceiling to floor windows and at the other there are pocket doors leading to the office. The master bedroom is 14X15 foot, king bed, dresser, vanity, 2 closets and adjoining bathroom. Access to the laundry room is in one of the closets. The adjoining bathroom has a jetted tub with shower. The office is 15X15 foot . It has a floor to ceiling custom bookcase, desk and storage closet. The office has access to the den, dining room and bathroom. In 2009 the house and cottage had major renovations. This included new hail proof roofing, new electrical wiring with built-in smoke detectors and new plumbing including repair and replacement of gas lines. Ceiling fans/lights were added in all bedrooms, dens, and both kitchens. The original old wood pine floors were stripped, stained and sealed. The entry, dining room, den, and office have ceiling to floor window treatments. All of the windows in the house were replaced with Jen Weld double pane windows. Cellulose insulation was blown in the attics. In 2016 two new HVAC systems were installed. In 2018 a custom 7X7 walk-in storm shelter was built in the carport. Guests can get in the shelter without getting wet or going down stairs. All of the appliances, guest beds and linens and furniture in the bedrooms are included. Most other furnishing are negotiable. The owners are retiring but will be available for consulting during the start up.